Camelot Preschool Singapore is an exciting development stage of your toddler. There are many signs of progress in their physical and mental abilities. Your child develops muscular and concentration precision till the age of 3. Parents can look forward to seeing the following improvements. Muscle Strength: A proper development care centre Singapore pushes your child creatively and academically to understand their body capacities. Their neural hands and finger muscles respond to them and function efficiently if worked hard by the educarers at the preschool. The curriculum is designed to achieve different skill set, one of which is muscle strength in your child. Eg: Before entering preschool your child was holding a crayon in his fist for coloring a picture but after proper guidance and development functionality in the school he has learned to hold crayon as an adult. The drawing of your child has become more precise and detailed than before, their observance power on seeing the object and making the same has grown which help in concentration and remembering skill with hand coordination to achieve the end result. Impressive Precision: Preschool educarers will assist your child’s development through chosen activities. Molding clay, drawing, coloring, building blocks, story enacting etc. inculcates precision which is a bright step for schooling education. Puzzles pressurize their mind to think and concentrate while doing their everyday task. Your child staying away from you builds up an immense individual confidence and face the worldly affairs in his own way. It is important to let them find their way and form an utter understanding of the things surrounding him. Eg: Earlier your munchkin was scribbling on the drawing paper and decides it to be a dog, after going to preschool he will start to think what to draw sensibly and try to fill effective colors in the drawing. 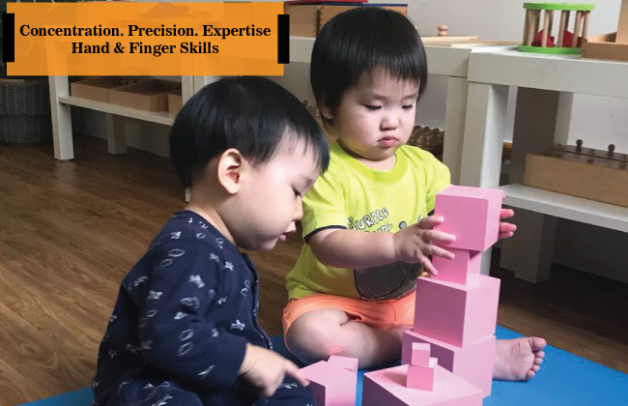 Sending your child to a preschool and infant care centre Singapore staffed by development experts ensure their skills will continue to grow in a nurturing environment. Give your child a boost with the educational opportunities available at Camelot International Infant Care Centre Singapore. The centre provides high-quality education under one roof. Register with Camelot today and see the improvement in your child.